Melania Trump has found herself being relentlessly mocked online – after giving a speech on the dangers of cyber-bullying. The US First Lady had set out combating cyber-bullying as one of her main priorities before entering the White House – although she is not believed to have set up a defined programme as yet. Wednesday’s speech to the spouses of dozens of world leaders during the UN General Assembly was another chance to set out her agenda and focus for the next few years. “No child should ever feel hungry, stalked, frightened, terrorised, bullied, isolated or afraid, with nowhere to turn,” she said, urging others to heed her call for action. 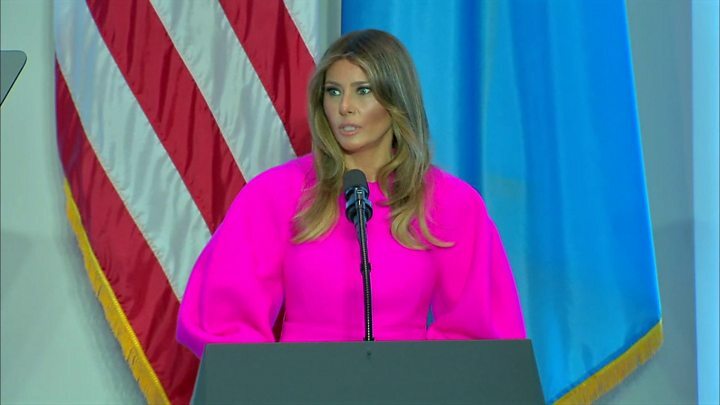 Unfortunately, that message was lost somewhat as social media’s attention turned to her choice of outfit – a voluminous pink dress costing a reported $3,000 (£2,222). However, others were more keen to focus on the contents of the speech itself – and were equally unimpressed. Did Melania ‘like’ a tweet mocking Trump? “We must teach each child the values of empathy and communication that are at the core of the kindness, mindfulness, integrity and leadership which can only be taught by example,” Mrs Trump said, raising more than a few eyebrows in the process, given her husband’s online behaviour. “By our own example we must teach children to be good stewards of the world they will inherit. Donald Trump has been accused of using his own social media accounts to bully a vast array of people. Most recently, he retweeted a GIF (an animated image) of himself hitting a golf ball at his former opponent Hillary Clinton, causing her to fall over. Her husband’s prolific and high-profile attacks led one Twitter user to suggest an easy way for Mrs Trump to end the scourge of cyber-bullying.